1 of 1 In medium-size bowl, whisk together mayonnaise, sour cream, vinegar, lemon juice, salt and pepper. Stir in parsley, scallions and chives. Cover and refrigerate until ready to use. 1 of 3 Place potatoes in medium-size saucepan; cover with cold water. Bring to a boil over high heat. Reduce heat to medium-high; simmer until fork-tender, about 8 minutes. Drain potatoes. Place in medium-size bowl; let cool slightly. Reserve 1/2 cup of dressing to serve with fish. Add remaining dressing to potatoes; gently stir to coat potatoes. Cover and refrigerate for at least 1 hour. 3 of 3 Sprinkle 1/2 teaspoon lemon pepper on each side of swordfish. Grill 4 minutes on one side. Turn over; grill 3 minutes or until cooked through. 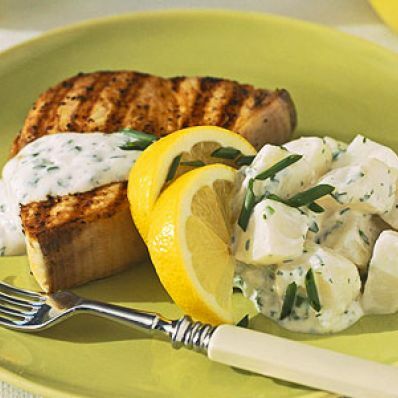 Serve swordfish with potato salad and reserved dressing on the side. Per Serving: 29 g pro., 372 kcal cal., 949 mg sodium, 3 g fiber, 4 g sat. fat, 67 mg chol., 15 g Fat, total, 30 g carb.